1). Adjust RV1 potentiometer, according to your battery or LED, set the output voltage to the voltage you need. For example, for 10 series LED voltage, regulate voltage to 37V. Note: Do not use a short circuit method to adjust the current, the circuit structure of the boost module cannot be adjusted in a short circuit way. 1. VIN+ is the input voltage positive side, VIN- is the input voltage negative side. 2. OUT+ is the output voltage positive side, OUT- is the output voltage negative side. 7. 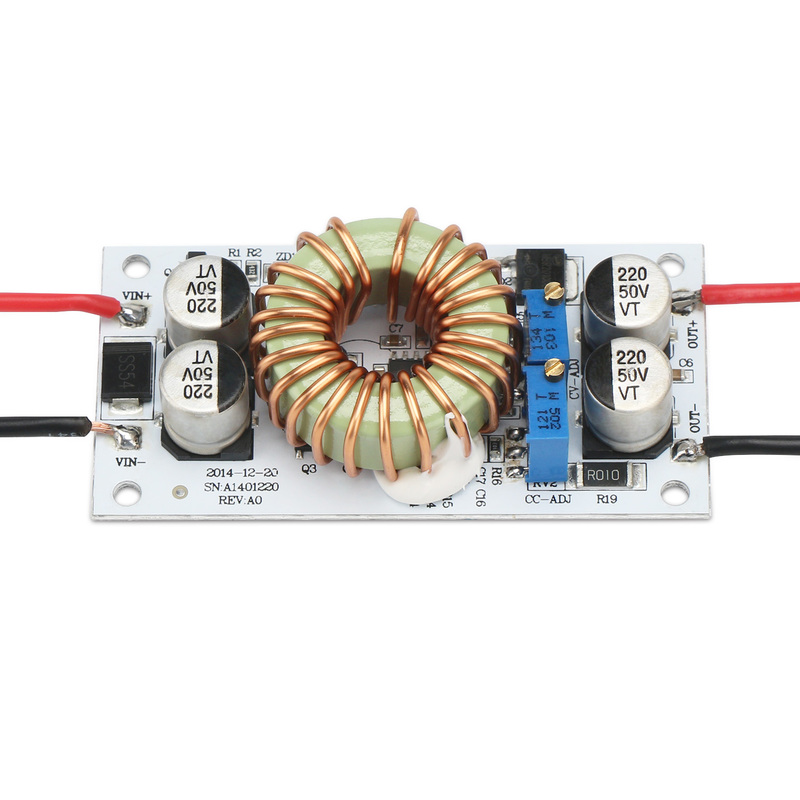 The maximum input current cannot exceed 6A, the power cannot exceed 240W. 8. Must ensure that the input voltage is lower than the output voltage at least 2V. 9. Before connecting the load, please adjust the required voltage and current at no-load (no-load voltage should be increased by 3~5V at constant current mode). 10. When using switching power supply or other secondary power supply, please ensure that the power supply power should be double more than the power of the module. 1. the input and output cannot be reversed connection. 2. The input and output voltage, current must not exceed the maximum value during work to avoid damage to the boost converter module. 3. When working with full load for a long time, pay attention to ventilation and heat dissipation to extend the life of the boost converter module. 1. DIY a stabilizer power supply, input 12V is ok, the output can be adjustable in range of 12~50V. 2. Offer power for your electronic equipment, you can set the output voltage value according to your system voltage. 3. As the car power supply offer power for your laptop, PDA or a variety of digital products. 5. Solar panel voltage regulator. 6. Charge for the storage battery, lithium battery etc. 7. Drive high-power LED lights.